This guide will walk you through the options for sharing or distributing your survey using our Launch Wizard. NOTE: The Launch Wizard is optional and intended for new users or users who don’t want to manually configure all their survey settings. If you’re confident that all your survey settings have been configured properly, you can skip the Launch Wizard and go straight to sharing your survey. 1. From the Survey Editor, select the Share drop-down on the right side of your screen. Select Launch to begin the survey launch process. At the end of the Launch Wizard, your survey will be active and ready to collect responses. NOTE: Survey permissions, response options, and activation settings can also be configured manually from the Survey Editor -> Configure menu. If you are already familiar with all the survey settings and have configured them properly, you can skip the Launch Wizard and go straight to sharing your survey. 2. After selecting the Launch button, a pop-up window will appear. The first step is to select a survey response permission type. Survey permissions allow you to control who can take your survey and whether respondents will be captured as “anonymous” or “known.” For more details on permissions type, see our Survey Permissions Guide. CHECKBOX TIP: When you select a survey permission type, an explanation the permission type will appear on the right side of the window. Be sure to read through all of the options before making a selection. When you have selected a permission type, select Next to continue to Options. 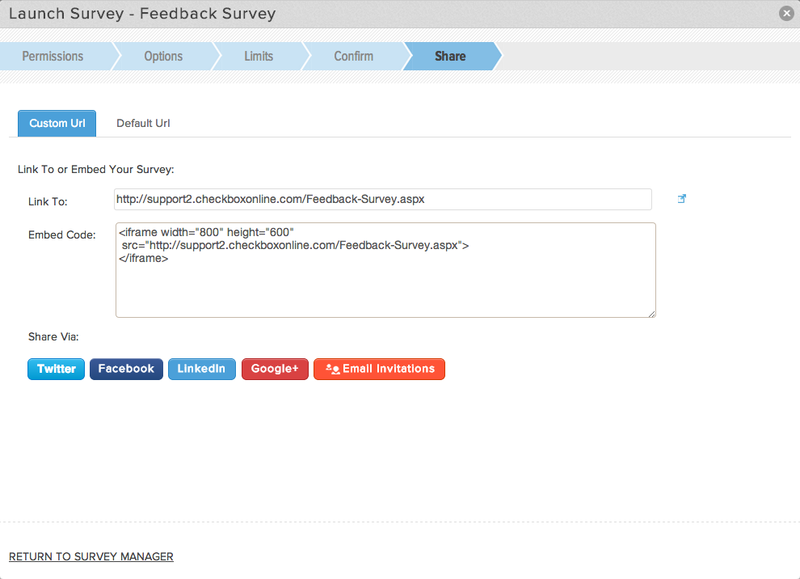 Allow respondents to return to previously completed pages while taking the survey. 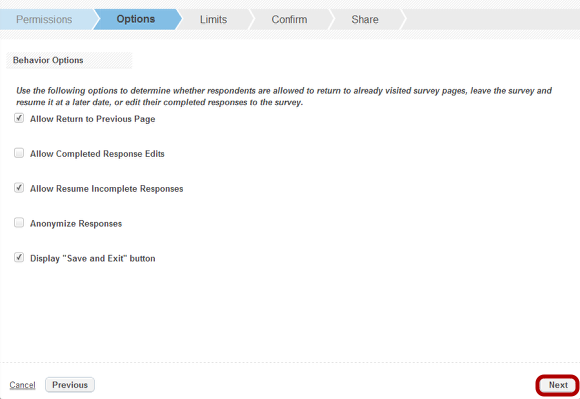 Enabling this option inserts a “back” button so that respondents can move backward in a survey prior to submission. 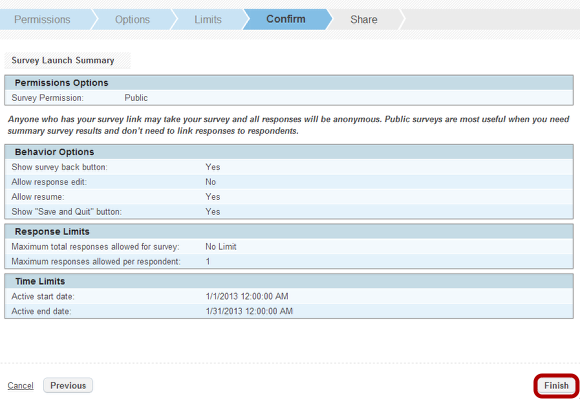 Allow respondents to edit previously completed responses. 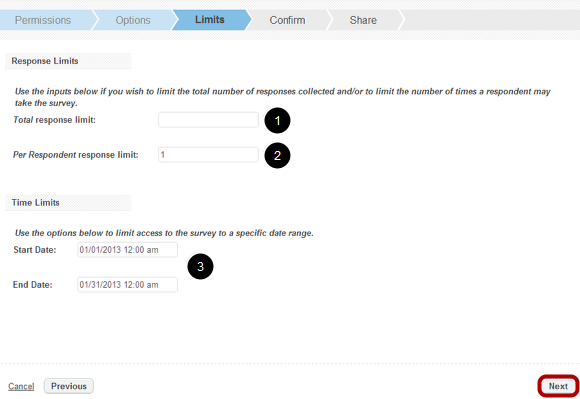 Enabling this option means that respondents will have access to their survey response after initial submission. Allow respondents to stop and resume their response at a later date. This means that a respondent can save and exit the survey before submitting it and return later to complete it. Anonymize responses, which means that all respondents will be captured as anonymous regardless of whether or not they are registered Checkbox users. Display a “Save and Exit” button. 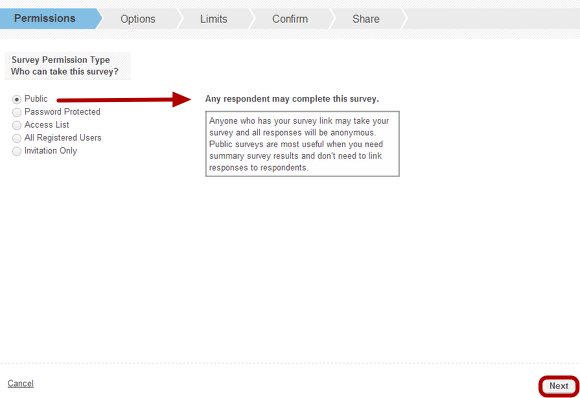 If you enabled the option to allow respondents to stop and resume their survey, select this option to save their survey. Select Next to save your changes and continue. Select Previous if you wish to return to Permissions. Set the total response limit for a particular survey. If the limit is reached, potential respondents will be unable to complete the survey. Limit the number of responses per respondent. You can only limit the total number of responses per respondent for registered Checkbox users or respondents that access the survey via a Checkbox email invitation. Set a response start and end date. NOTE: A survey must be set to active prior to the response start date. Select Next to save your changes and continue. Select Previous if you wish to return to Options. 5. Confirm your launch settings and select Finish to view sharing options. NOTE: If your survey wasn’t set to “Active” before starting the Launch Wizard, it will automatically activate as soon as the Finish button is clicked. Copy the provided survey URL to share your survey via personal email, web page, social media, etc. Share the survey through your Twitter, Facebook, LinkedIn or Google+ networks. Select desired network and follow prompts. Embed the survey into a web page by copying the iframe code provided and pasting it into your web page’s HTML editor. Create and deploy a Checkbox Email Invitation to a group of potential respondents. If you select Send Invites, you will be brought to the Invitations Wizard where you can build an email invitation and invite users to respond to your survey. For additional details on sending email invitations, see our Email Invitations Guide. At the bottom of the Launch Wizard window, you also have the option to save your launch configuration and Return to Survey Manager. NOTE: The above sharing options can also be reached directly from the Survey Manager under the Share menu.